Being a VA is very fulfilling work for people that are self-motivated. But you have to know how to manage your time effectively. Getting to work with other entrepreneurs and business owners, helping to grow their lead base, marketing their services and building their brand makes you feel accomplished at the end of the day. However, when you have multiple clients that you’re juggling, being organised is the only way to keep your work-life balance in check. As an experienced VA who is successfully running a virtual assistant business, I’ve come across some really great techniques for staying on top of everything. These strategies work for me and my team. I want to share some of my favourite tips for time management, which can be used specifically for those doing virtual assistant work. Schedule out your days by using time blocking. You’ll probably realise you’re wasting a lot of time without even knowing it. By blocking out time to work on specific tasks each day, you can avoid getting distracted and stay focused. This means more work gets finished in less time. I always try to schedule my meetings together so I don’t have to break up my day. I also have time scheduled for specific tasks and when I can take calls, so I can focus on other things at different times of the day. An endless to-do list seems overwhelming. Organise your project management system by due date at the beginning of the week by setting deadlines for various tasks. Always place the most urgent ones first. Paired with time blocking, you will always be ahead of the game getting work done that needs to be done first. Most virtual assistants work from home. There’s a lot of pros and cons of this, but to be effective at what you do you need to have a designated work space. This space should be organised and quiet, free from distractions such as children or chores. Even if you live in a smaller home, set aside a quieter area for your desk away from visual distractions. Also, make sure the office is properly setup with all the right equipment to get the work done, including backup computers and internet in case anything fails. 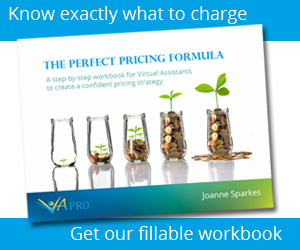 VA’s have so many free and readily available resources for organising their work. The virtual office is so sophisticated, so take advantage of all the resources out there that will make you more efficient. There’s tonnes of project management software and communication apps. If you have a need to be filled, there’s bound to be some technology out there to help you. You need to be realistic about how many hours you’re working a day. Don’t work your life away. Be clear with your clients when your office hours are and when they can expect you to be at your desk working. These are my top tips for enhancing productivity and for managing your time properly. Have you ever used any of these techniques as a VA for improving your workflow? Or are there other other strategies you prefer? Share with us below.